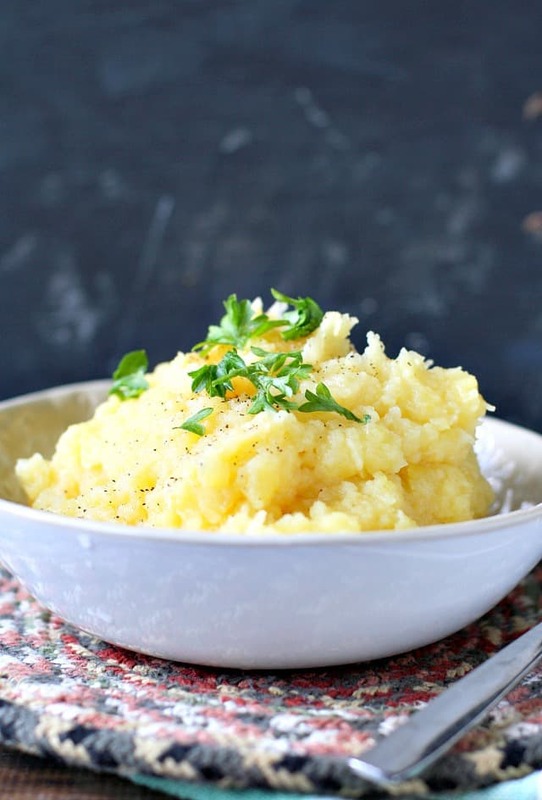 Home » Side Dish » Slow Cooker Mashed Potatoes (Dairy Free). 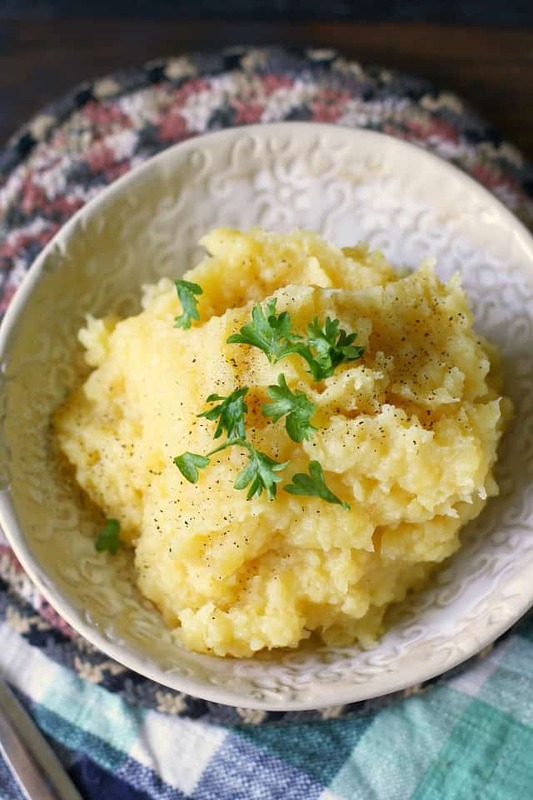 Slow cooker mashed potatoes are creamy, buttery, and the perfect side dish for Thanksgiving. 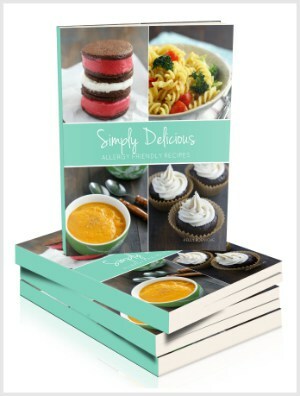 Save some room on the stove and let your slow cooker do the work with this easy recipe! What’s the biggest challenge on Thanksgiving day? 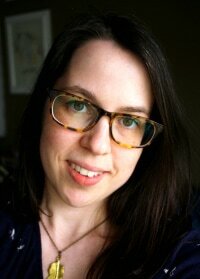 I’m sure we could all name a few challenges, especially if you are cooking for food allergies or intolerances, but I think one universal complaint would be timing the use of the stove/oven so that everything gets done on time. 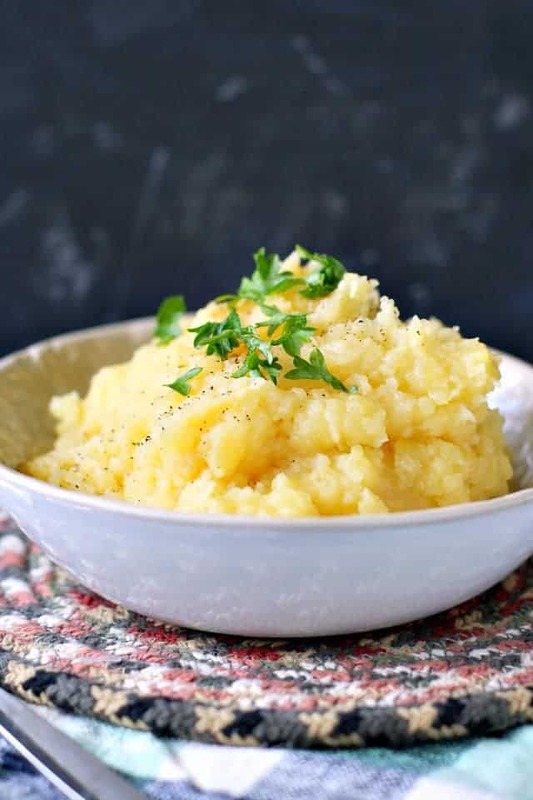 These slow cooker mashed potatoes are a great way to make sure the potatoes are done to buttery, creamy perfection, without taking up any oven space or time. Yes, you can, and it’s super simple! Just place the potatoes, water, dairy free milk and butter, and salt in your slow cooker and cook on high for about four hours. How many potatoes should I use per person for mashed potatoes? You’ll want to plan on about a half pound of raw potatoes per person. So if you need to serve 8 people, you’d want to use 4 pounds of potatoes. 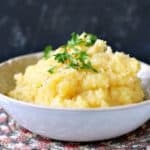 What type of potatoes are best for mashed potatoes? Potatoes that have a higher starch content will produce the fluffiest mashed potatoes. Try Russet potatoes or Yukon Golds. Learn more about potato varieties here. How do you make mashed potatoes in the crock pot? 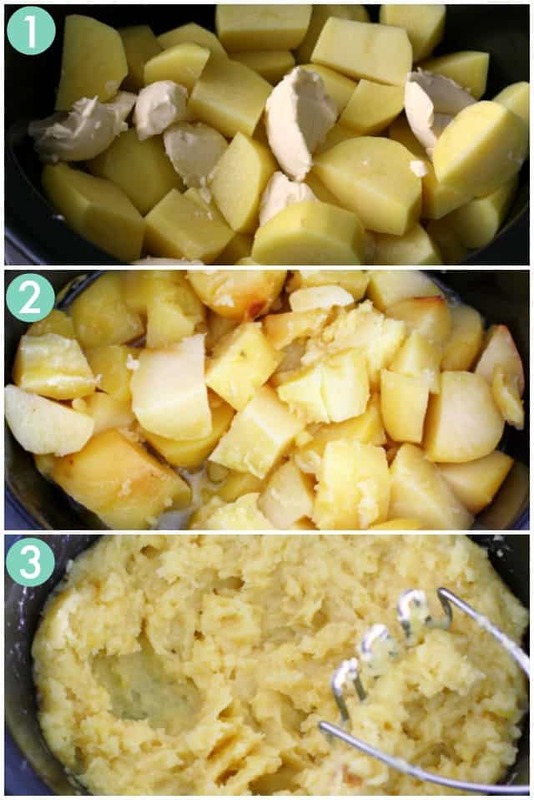 Cut the potatoes into large pieces, and place in the crockpot or slow cooker along with vegan buttery spread, non-dairy milk, water, and salt. Cook on high for about four hours. Use a potato masher to mash them until they are smooth and creamy. Season with salt and pepper if desired. How far ahead of time can I make mashed potatoes? Making mashed potatoes the night before you serve them isn’t recommended, because refrigerating them and reheating them will result in pasty or dry potatoes. Cooking them in a slow cooker is a nice compromise, because you can do it several hours before the meal will be served. You can freeze leftover mashed potatoes, but the texture may change. Learn more about how to freeze potatoes here. Make these buttery, creamy mashed potatoes in the slow cooker and save some time on Thanksgiving day! Place the potatoes, water, vegan buttery spread, non-dairy milk, and salt in a 6 quart slow cooker. Place the lid on and cook for 4 hours on high heat. You may want to check the potatoes after the third hour - if they look like they are drying out, you can add a little more warm non-dairy milk. Once the potatoes are tender, use a potato masher to mash them in the slow cooker. Season with more salt and pepper if desired. The butter and milk will slightly caramelize around the edges of the slow cooker. This is normal, and will result in a nice flavor. 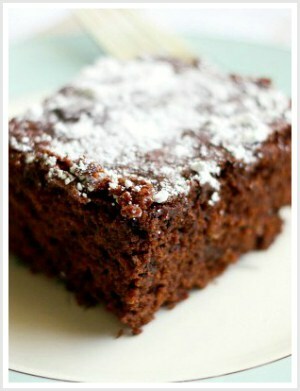 However, you can scrape it off with a spoon if you want. If you aren't dairy free, go ahead and use regular milk and butter. I haven't tried cooking these on low for 8 hours - doing so may result in discoloration or gummy potatoes. 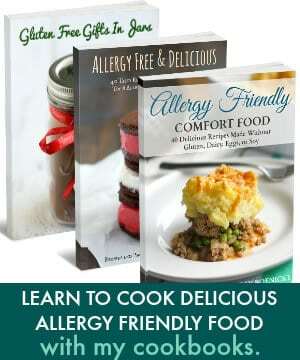 If you’d rather make mashed potatoes on the stovetop, try my recipe for the best dairy free mashed potatoes and gluten free gravy. « Vegan Gluten Free Gingerbread Men.